Matt is also going for timeless panache for his party attire! Layering menswear pieces is the way to get a unique and stylish look for any guy. Here we have a pale-green button down dress shirt set off with a blue floral tie as our anchor. By adding a gray pinstriped vest, and gray, black and tan plaid dress slacks, we ground the lighter colors. Remember that tones can be complementary but not necessarily matching like our vest and slacks, proving once again that you should always mix and match different pieces from your wardrobe. This will create an aura of richness for the outfit. 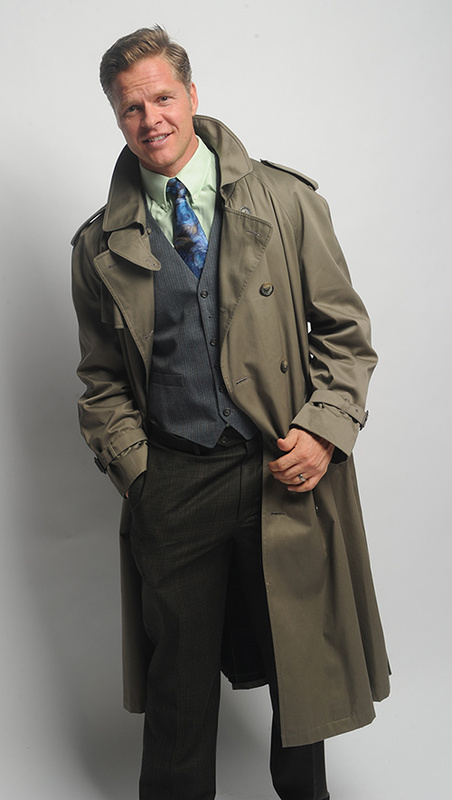 Topping it all off is a fantastic taupe/putty-colored trench coat, which can be thought of as a year round option for the discerning gentleman on the town. Matt’s own favorite shoes complete the look. Classic, elegant, and masculine are the key words here for the guy who wants some style this holiday season! Anna is taking evening glamour to new heights this holiday season featuring some of the top trends in fashion right now. Nothing is more dramatic, yet tasteful than a one-shouldered gown. The blue glitter on black fabric dress is made of cracked ice material that is lightweight and flowing. To add dimension and more glamour we’ve pinned an oversize starburst brooch in green and cream to the shoulder. Brooches and pins are a quick way to infuse sparkle and shine on any outfit. More accessories that keep the movie star feeling going include: drop rhinestone dangle earrings, three gold bangles, one black bangle, black strappy heels, and a silver beaded formal handbag. Looking like a million bucks doesn’t have to break the bank, as we prove this month with this dazzling ensemble!